It's been a rough week for cyclist Lance Armstrong and Notre Dame football player Manti Te'o. It is being reported that Armstrong has admitted to the use of performance enhancing drugs in the past and, as a result, has jeopardized his standing as an American icon. 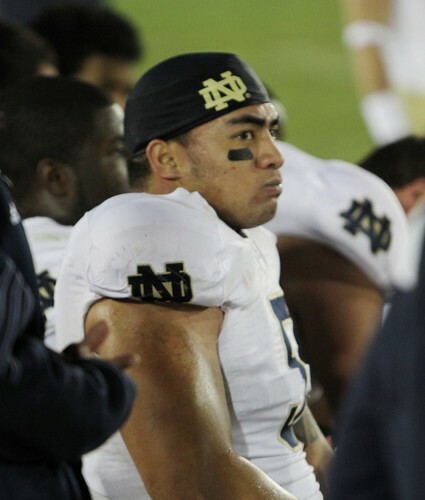 In Te'o's case, it appears that the story of his deceased girlfriend was all a hoax. Whatever role he played in the charade is yet to be determined but, at minimum, it seems that he was not honest about it even after learning of the prank. These instances, of course, are not the first cases of our athletic heroes disappointing us. In recent memory we've also seen legendary figures like Joe Paterno, Tiger Woods and too many MLB players to name have failed to live up to our expectations of them. With the advent of social media, the public response is swift and strong when these stories come to light. We can easily cast our judgments about our heroes without knowing all the facts and are quick to make light of their perceived failures. Without excusing the lies of those we've placed on pedestals, I do wonder if the expectations we place on our heroes might be asking too much. Do we allow them to be human...or do we literally expect them to be superhuman? I don't think it's unreasonable to ask our sports heroes to be people of integrity and to be honest with their fans. But we must realize that they are not perfect and that they will fail us. Athletes are no different than any else in regard to their humanity. They may happen to enjoy tremendous athletic success, but they still struggle with the same insecurities, need for acceptance and even the same sins that we all do. It seems to be an American pastime to worship people as they rise...and ridicule them as they fall. How sad. Although it disappoints me when our heroes fail us, it doesn't surprise me. In a world where style is so often valued over substance and where we expect our heroes to perform superhuman feats, it's not unreasonable to surmise that some will cross ethical lines to achieve what they think we want them to become. I don't know all the facts about Lance Armstrong and Manti Te'o. But I do think it's fair to say that some of their behavior is wrong, even though we are not in the position to know their motives and what led them to deceive the public. I, too, struggle with wanting to please others and pretend to be something that I am not so that others will like me more. But as I've gotten older, I've learned that presenting a false self to others is ultimately not fulfilling. Because at some point, our true self will be revealed, the imposter that we've been presenting to others will become unmasked and we will be seen for who we truly are. I don't think we have to be fake with God since He knows all about us and loves us anyway. The conditional love of fans will never match the unconditional love of God. My prayer is that Lance and Manti would both come to realize the love, forgiveness and acceptance that can be found through an ongoing relationship with Jesus Christ. I don't know their personal lives so they may already have a relationship with God. But I hope they would both be able to experience God in such a way that they would be able to live honest and forthright lives in front of others. Although I'm sure they will both have difficult days ahead, my guess is that they will be resting a little easier at night knowing that the darkness they've been living in has now been revealed in the light. The heart of the Christian message is that we can never be good enough to earn God's favor but through faith in Christ, God accepts us as a new person. We no longer have to pretend to be something we are not. In the words of Pastor Tim Keller, the humble Christian understands that they are "more wicked than we ever dared believe, but more loved and accepted in Christ than we ever dared hope." May this be true of our heroes and of us. Amen. This is wonderfully true Scott. I know one thing both these men have been humbled. I pray they see the Lord in this time as well. Im learning not to put people on pedestals because people fall and man it hurts when they do even with me know Jesus can redeem any situation. All I can think of is that "We all have sinned and fallen short of the glory of God." (Romans 3:23)The difference is that most of us are not famous and therefore, the public isn't privy to our gross failures. Thank God only he knows all our sins. I'm not as disappointed when famed unbelievers fall in this way. It's more disconcerting to me when leaders of faith commit grievous sins and they're found out. Then their embarrassment become ours. But then again, "We all have sinned..."